Since Barielle Blue Cotton Candy reminded me of denim, when I went to add some nail art, that's exactly what I decided to see if I could turn it into, and... Well, for not having any real idea what I was doing, I'd say the results weren't too shabby! The basic plan was to suggest that woven cotton texture, something I knew I wouldn't be able to paint individual lines straight or fine enough to manage, so I decided to let the fan brush have a crack at it. First in a darker blue (Sally Hansen CSM Jungle Gem), then in slightly lighter (Revlon Colorstay Blue Slate), I swept across and down, not really worrying about lining anything up perfectly, just hoping to wind up with something vaguely crosshatch-looking. Then I grabbed a white nail art striper (Orly Crisp White) and added some double-stitching and a "back pocket" for an accent nail. Simple! To top it all off, I couldn't decide whether to go glossy or matte, so I didn't. In an attempt to underscore the whole "attempted denim" texture I was aiming for, once an initial coat of INM Out the Door was nice and dry, I dabbed and sponged both matte and glossy on top. The result was subtle, but I think it helped! All in all, some relatively simple nail art, but I like how it turned out. If I can manage it before I head out of town next week, I may try to recreate it for a tutorial. Rolling on through last spring's Barielle Sweet Treats Collection (...with a quick layover to handle some nail breakage...), this is the lone shimmer in the bunch, Barielle Blue Cotton Candy. The name "Blue Cotton Candy" fits with the collection's sweets motif of the collection, but I don't see cotton candy. I see denim...which is blue cotton...so is it a pun? If so, just...dag. 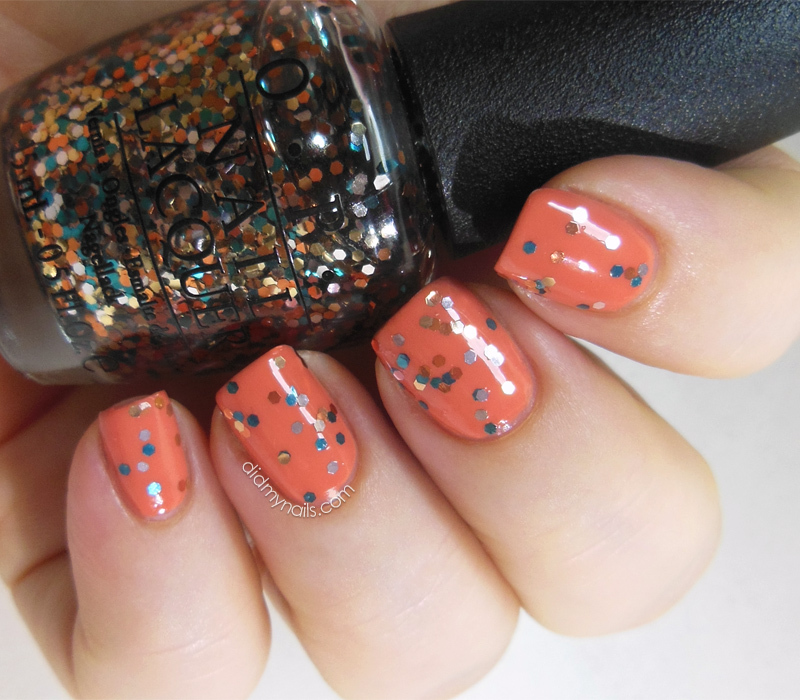 But completely aside from how confused I am by the name, I quite like this polish! It's a pretty blue, nice and dusty with a slight teal lean, just enough to give it some ocean-y depth in bright light. In dimmer light it embraces the lean, exploring those greenish, teal undertones. And in either light, the shimmer is fantastic! Apart from my love of the shade and the shimmer...sweet, merciful goodness, this brush was the worst mess I have ever pulled out of a bottle of polish. I had to gank out, like, a dozen bristles and trim a few others before it was even useable. There was a little bit of thickness to the polish, but it actually spread the best of the three "sweet treats" I've tried so far--really surprisingly well, given the state of the brush, and until I have another problem with one of Barielle's brushes, I'm going to write off that detail as an isolated fluke. Barielle Blue Cotton Candy is definitely my favourite of the Sweet Treats so far; even with my broken nails, I was peeking down at them and smiling all day. 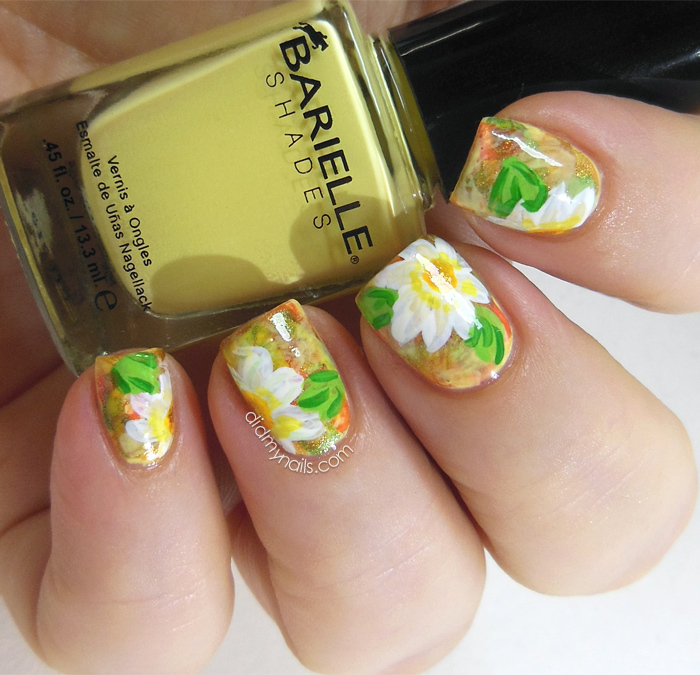 Another manicure from before my nail broke again (ugh, so mad I can't even), after I enjoyed Barielle Banana Drop's creamy, lemony-banana sweetness on its own, I went to town on its face with some brushstrokes and flowers. Have I mentioned how much I love brushstroke manicures? They give you such an awesomely textured look in barely any time at all. 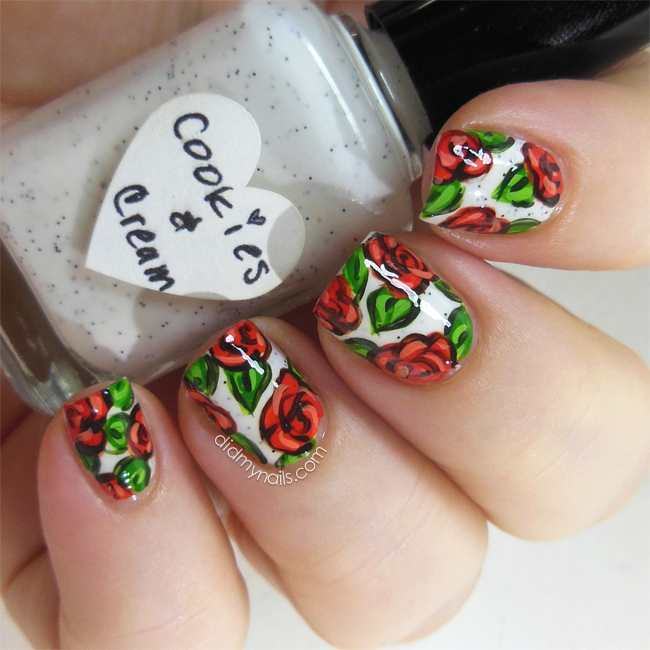 It's no secret how much I love doing flower nail art too, and I was excited to see how these two things would come together. Well, it definitely won't be the last time I fire up this combination because I loved it. The brushstrokes are made up of China Glaze Desert Sun, OPI Need Sunglasses?, China Glaze Riveting, SpaRitual Golden Gleam, Zoya Meg, and of course Barielle Banana Drop. 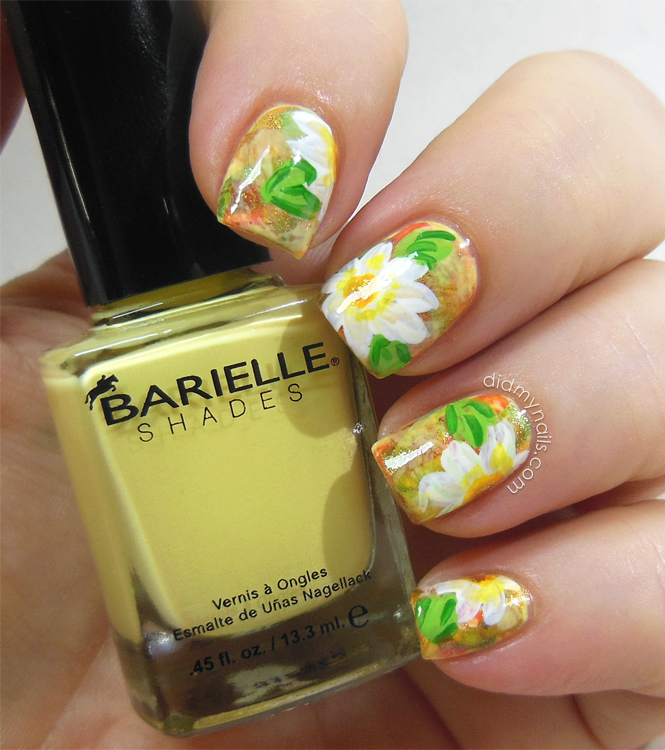 The daisies are acrylic paint, with a hit of Golden Gleam in the centers to tie it all in together. So yeah, I kinda disappeared this week, didn't I? With being sick and breaking nails and that cut on my finger and a great, big pile of general malaise ("General Malaise...") I just wasn't feeling it these last few days..."it" being anything much of anything. Time to kick myself back into the swing, though, because it's Tuesday! This week's theme is food and drink, and dang, did I wanna do something really, really cute. Unfortunately I haven't been able to get my hands on the OPI Coca-Cola polishes yet, and my nail art efforts ended in failure and recriminations. But! Just before the breakage, I swatched Barielle Banana Drop, and hey, banana is food! This is three coats of Barielle Banana Drop, from the same Sweet Treats collection as Orange Parfait. I did need all three to get things all even and smooth, but that's pretty much par for the course with yellows, isn't it? I definitely like the colour! It's light and fluffy, like a baby chick (or possibly, like a banana), bright but soft and all kinds of lemony cream. Really a cute yellow, and even if it's a bit of a cheat for this week's theme, I'm gonna count it. Did some non-food nail art on top after I took these pics, which I'll probably have up tomorrow. This week doesn't look to be much better than last (not really sick anymore, but the malaise is all malaisier), but I do have some pics in my folder to post. Hopefully I can get those up these next few days and start feeling in the swing of things again. In the meantime, I'm really happy to welcome our newest Twinsie, Lisa! I'm very excited to be pitching in over at Polished Elegance today while Lisa is on holiday in NYC! More pics and some fascinating blurbiness over at Polished Elegance. Thanks so much to Lisa for having me! About a week ago I rescued The Hungry Asian Cookies & Cream from the Big Box o' Untrieds at long last, and not surprisingly, I loved it. So like I often do, rather than take it off in the morning I kept it on and embellished with some rose nail art. Oh my gosh, I loved this combination! I also loved that they totally reminded me of Tuxedo Mask (Sailor Moon 4 EVA, y'all!). 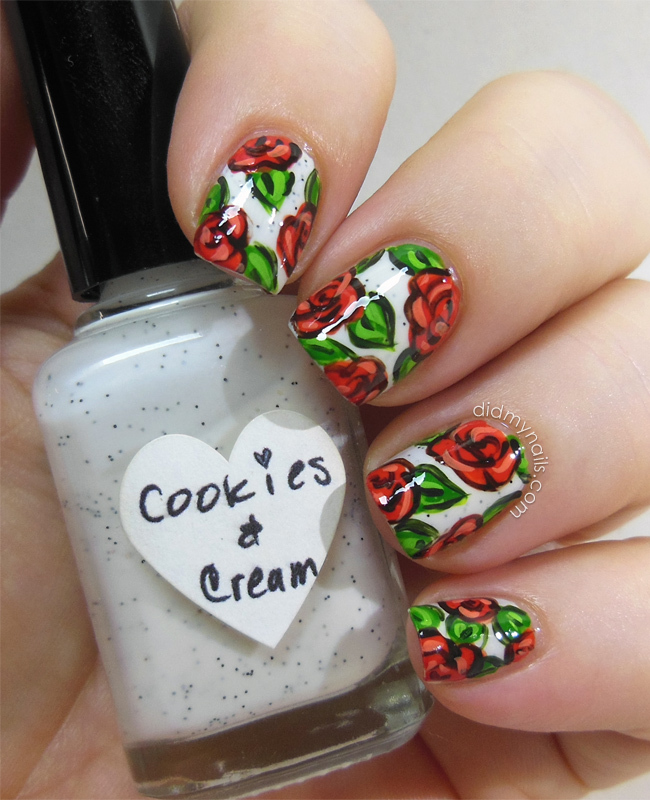 Red roses on white nails are always a great look, but the little, black speckles in Cookies & Cream added a nice, subtle depth and dimension. These were acrylic paints as usual, done much the same way I've done a lot of my flower nail art lately, outlined bold and dark. I also tried adding some highlighting on the petals, and I liked how that came out. Thank you, acrylic paints, for being SO much easier to work with than nail polish! Not much more I can spin out the fascinating story of adding red roses to this pretty polish, and now I've got Sailor Moon on the brain again. ("Gomen ne sunao ja nakute...") Gah, I can not wait for the new series to start... Fangirl mode: ACTIVATE! So yesterday I wore Barielle Orange Parfait, which I thought was more pumpkin/salmon than orange-type dessert, and while it was a nice enough colour, it didn't do much for me. Still, I decided not to give up on it yet. My original plan was to brush it with something gold (like, maybe China Glaze Golden Enchantment or the Sasatinnie glitter/foil I used for these Chinese New Year nails) and then paint some peachy flowers on top, but then I opened the drawer and happened to catch sight of OPI The Living Daylights. I thought the copper in The Living Daylights would be a nice match for Orange Parfait, and I was not wrong! I think they go very well together, and I love the contrast of the teal. This is one coat, half-brushed and half-dabbed, and I don't know if it's the different base colour this time, but I can clearly see that it has silver and gold to go with the copper and the teal. I also layered a couple coats of...whatever this The Face Shop jelly I used is called, because I can't see the white-on-clear label very well...on top (it has a pink grapefruit tint to it, but it's still quite sheer). I thought I might matte the whole sandwich next, but I liked that little bit of shiny squishiness the jelly gave it. In fact, I was very happy with how things turned out. I don't know how much tint or colour change there is, or if it's just dressed up with a little sparkle and juice, but I like Orange Parfait much better on me today. I've started to make a habit of peeking into Bonjour every now and then because you never know when they're going to have a new...well, new to them...set of Barielles on deep discount. Case in point, like the Dazzling Diamonds collection I grabbed a while back, I recently picked up last spring's 5-piece Sweet Treats collection for about $12 US, and I decided to break it in with Orange Parfait. I ended up doing three coats of Barielle Orange Parfait, two after adding some thinner, in an effort to get it all nice and even. While it was nicely opaque it was also kinda...globby? It just did not want to self-level, and I ended up goosing the 3rd coat by rushing a thick layer of SV. I did have a quick look around online, though, and this doesn't seem to be the majority experience, so your mileage may well vary. Formula hurdle aside, I don't think this is the right shade of orange/peach for me. It's a little murkier than I'd have expected from an Orange Parfait; I think it's actually more pumpkin/salmon than orange. I have a strong suspicion that on someone with a bit darker skin than mine, this just might look amazing, but I'm not really in love. There's nothing wrong with it; it's just kind of there, looking slightly dated against my skin tone. Still, it came at a good price, and I'm going to see if I can make it work for me, maybe add some artwork or a little bit of glitter. Wish me luck! 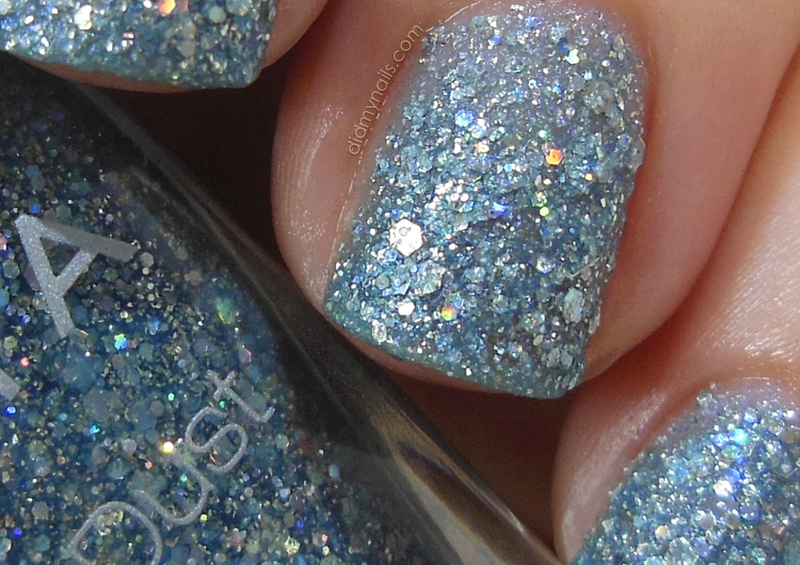 From last year's Summer 2013 Mash Up Collection, Orly Pretty Ugly is a gorgeously squishy, iridescent shimmer in soft, minty blue. I've used it before as a detail in some nail art (lucky koi) but never on its own, which, shame on me. I love it! This is three coats of Orly Pretty Ugly, which were nicely opaque (that ghostly hint of VNL was totally invisible in person). The formula is quite jelly-like, not that richly pigmented, so it retains a nice hint of squishiness for the bright, iridescent blue shimmer to dance on top of. For many, two coats will be fine for daily wear (particularly if you don't mind a teeny bit of VNL under your jellies), but this is one of those polishes I could easily see I'd need that extra coat of. But half the time I'm doing a third coat anyway for compulsion's sake, so it was hardly any trouble. Especially when the payoff is that fabulous shimmer! ...and I can't think of a much better compliment than that. This week's Twinsie Tuesday theme is a manicure with a 3-D feature like stones, studs, or fimo slices. I went with studs, which I really think I need to wear more often because I'm crazy about the effect! I decided to do a composite (another look that I am fast falling in love with! 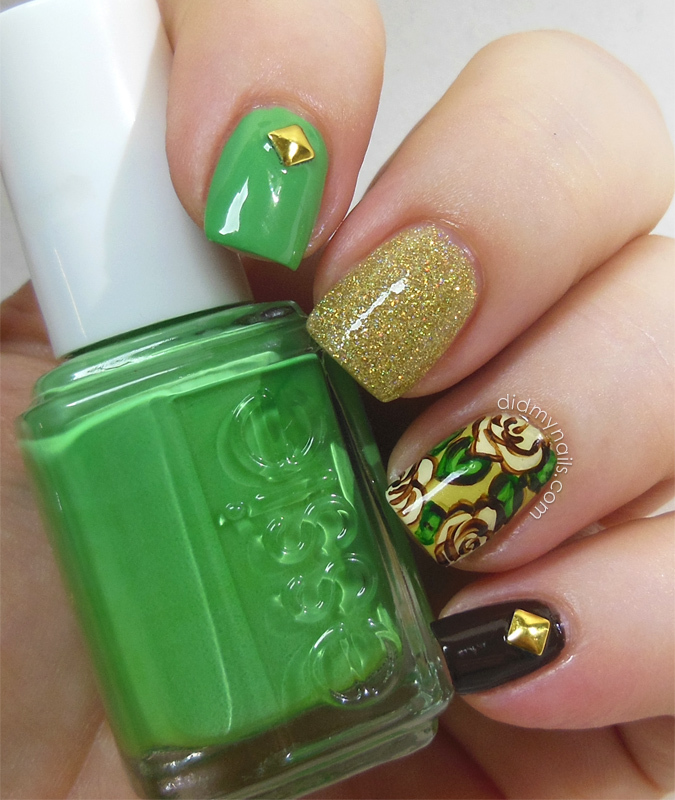 ), combining floral nail art, a full-cover glitter, and a couple of corresponding cremes under the studs. I wasn't sure I'd be as into gold, since I'm usually a much bigger fan of silver, so I chose these colours specifically to compliment the gold-coloured studs. I think the combination works! The golden glitter is China Glaze Angel Wings. Next to that I chose OPI Don't Talk Bach to Me as my base for the acrylic paint flowers (a combo I've done a time or two before), and the index and pinky are Essie Mojito Madness and OPI Suzi Likes Cowboys. Eep, sorry, a quick double-check, and I'm reminded that she in fact loves them. It's more than like. OPI Suzi Loves Cowboys. 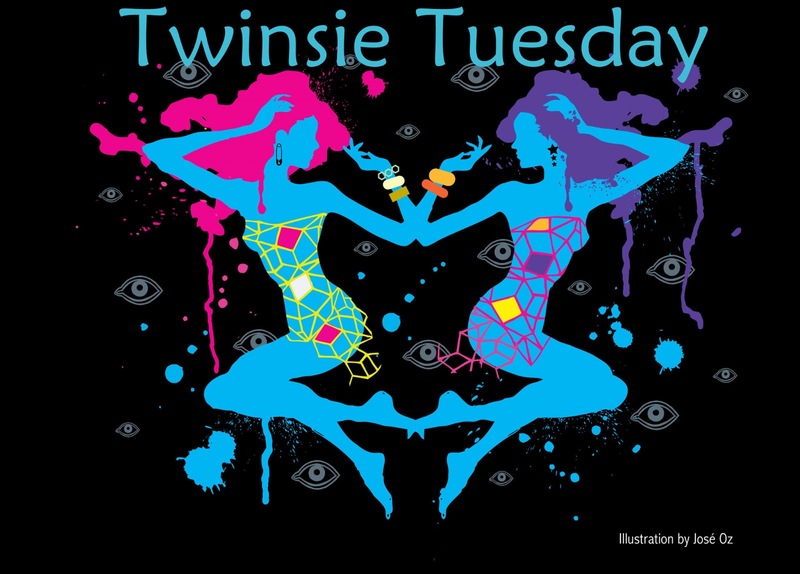 Can't wait to see what the others chose for their 3-D accents, and I'm super psyched this week to welcome Cordia of Seriously Swatched back to Twinsie Tuesday--we missed you, girl! The recent Zoya Naturel Collection reminds me of the Naked 3 eyeshadow palette by Urban Decay; it's neutral but with a rosy twist. Now, outside of nail polish, I know squat about makeup and fashion and all that jazz. I know polish, I've heard of the Naked shadows, and that's it. So if I noticed them both doing a thing... maybe this is a huge trend the rest of the world is totally aware of, except for me? I don't know. I just know that I like it. And apparently I'm not the only one because while I had several of the Naturels on my shopping list, I was lucky to bring home Zoya Normani. Zoya describes Normani as a sable mauve. I never, ever seem to agree with companies' product descriptions, but this is pretty much spot on. Normani is that exact, awesome shade of lavender-ish greige that was so huge a little while back (and again, if I noticed it, then it must have been huge), only subtly updated with a hint of warmth to bring it back towards neutral again. I really do love this shade. I mean, I didn't think a neutral could smoulder, but there it is! Between that and the formula, I'm definitely heading back to the store with fingers crossed for more of the Naturels. The Hungry Asian Cookies & Cream was one of the very first indies I ever ordered, and I'm downright flabbergasted that it's taken me so long to rescue it from the Big Box o' Untrieds. Flabbergasted, I say! 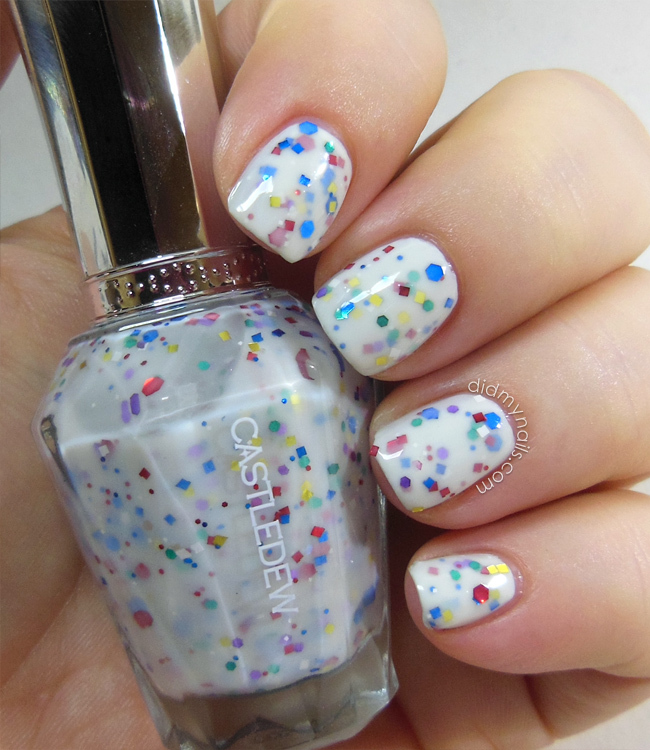 Cookies & Cream is a sheer, milky polish which Kae recommends layering. I'm wearing 3 coats here over a very thin coat of OPI My Boyfriend Scales Walls, a favourite off-white polish that I just might have mentioned a time or seventy. This polish really does remind me perfectly of those itty bitty speckles you get in a spoonful of melty cookies & cream ice cream (though maybe the spoonful isn't strictly required to be melty...I always wait for my ice cream to melt a bit, though, for a more favourable creaminess-to-brain-freeze ratio, and I can't even imagine how riveting you must find this awesome tangent). Lookit, cookies & cream! Adorable! 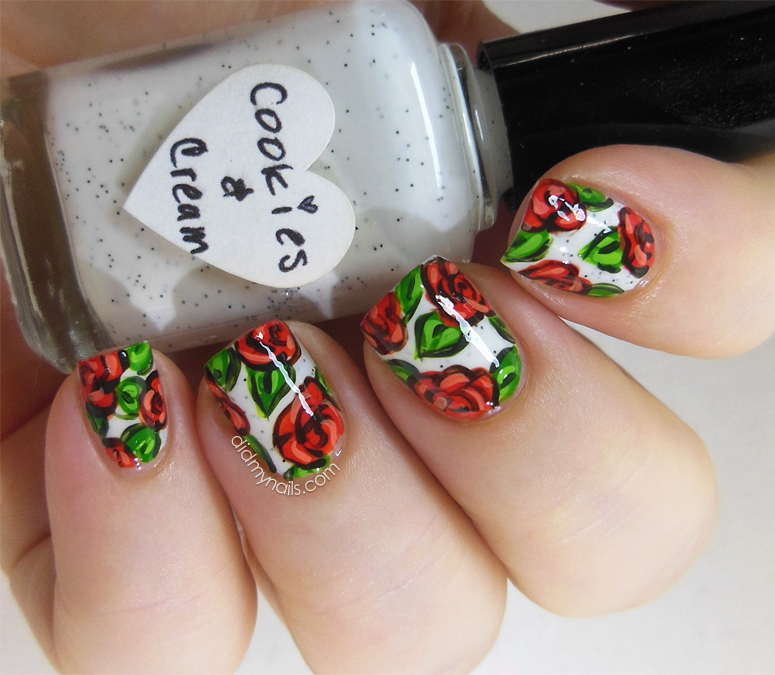 Cookies & Cream and other The Hungry Asian polishes are available at Kae's Etsy shop. A couple of weeks ago I finally picked up the original Zoya Magical Pixie Dust trio and tried Vega, the pretty, sparkling blue. 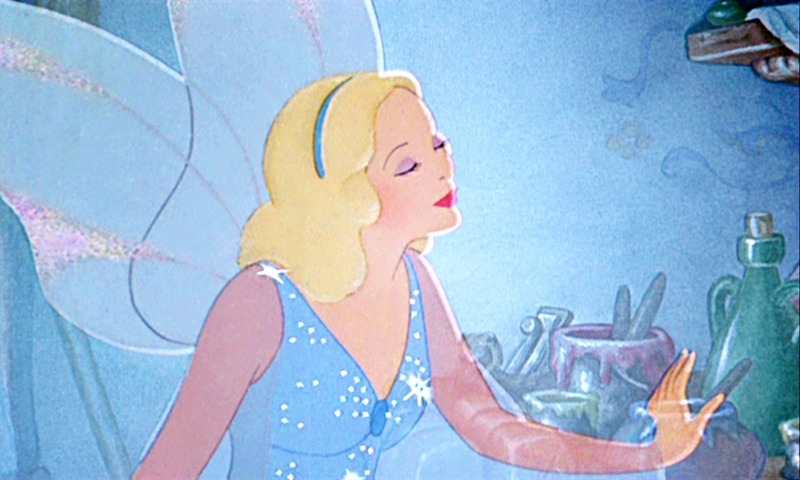 I could not stop thinking of Cinderella! Zoya Vega's formula is a little thicker than regular Pixie Dusts, what with the added glitter and all, but it's very workable. The first coat was easy, after which I waited a few minutes to be sure it was dry before moving on. The second coat was also thick but manageable. Basically, given all the texture particles and glitter bits up in there it's going to be chunkier than other polish. But application really only takes the littlest bit more patience, and I say, "Worth it!" If you're on the fence about the overall texture trend, the chunkier Magical line probably isn't going to be the texture that wins you over, but the fabulous holo-iridescent-glitter just might. And if you like the Pixie Dusts and OPI Liquid Sand (esp. the Mariah Carey ones, which tend to have more glitter), the gorgeous, opalescent sparkle in the Magical trio should be more than payoff enough for the extra bit of texture. On the other hand, there's always the option of top coating, which suits this pixie beautifully. It's thirsty, of course, so it'll take multiple coats to get a nice, smooth finish, but the results are absolutely stunning. I can't wait to try the others now! If there's a shade of nail polish I can not resist it's a soft, minty teal, so the minute I first saw it swatched, butter LONDON Poole went straight to the wish list. Yes, I already have minty teals in the double-digits, and no, I do not care. I want them all. From the Summer Holiday 2013 Collection, butter LONDON Poole is just the sort of colour that reduces me to ooey-gooey bits. This Tiffany-style teal is a bit dustier, and just a touch greener, than China Glaze For Audrey, and it's absolutely perfect for spring and summer. Formula-wise, it's pastel enough to drag a bit on the first coat--and on the second too, if you don't let the first dry enough or go back over the same spot too much--so my compulsive customary three coats were needed. Trying to avoid that dragging I left it with a little self-leveling to do, and it didn't exactly embrace the challenge. This is the second time I've worn Poole and had the same experience. Every other review I've seen, though, raves about Poole's typically-bL, flawless and easy formula, so I'm well prepared to accept my batch/bottle might not be indicative. Gah, so hard to choose just one favourite indie nail polish brand! I mean, Shimmer Polish does such consistently fabulous glitter mixes, and there's the eye-catching brilliance of KB Shimmer...and does a England count as an indie because phwoar!... But in the end I had to stand by the indie I've been fangirling since the moment I first laid eyes on it, and that's CrowsToes. I'm eternally crushing on Lauri's amazing glitters, but another reason I'm such a fan is her range. She also does stellar shimmers and duos and holos, and just about any finish you can name, she's done it. Like One Trick Pony, which was fabulous enough as a holo but then had to go and be a shimmer and a duo as well. Or Tequila Sunrise, whose golden-yellow shimmer is a stunning contrast to the bright pink base. And possibly my favourite yogurt-style polish ever, Milquetoast, which features gold and copper glitter suspended in a milky, crelly white. There are so many more swatches I'd also love to feature again--glitters like Frogs' Breath, Maxxed Out, and Her Goose Got Cooked, or the flat-out brilliance of Season of the Witch (I mean, that shift! and those flakies! ), but if I don't stop now this post is going to be eighteen pages long. CrowsToes can be purchased through Llarowe. 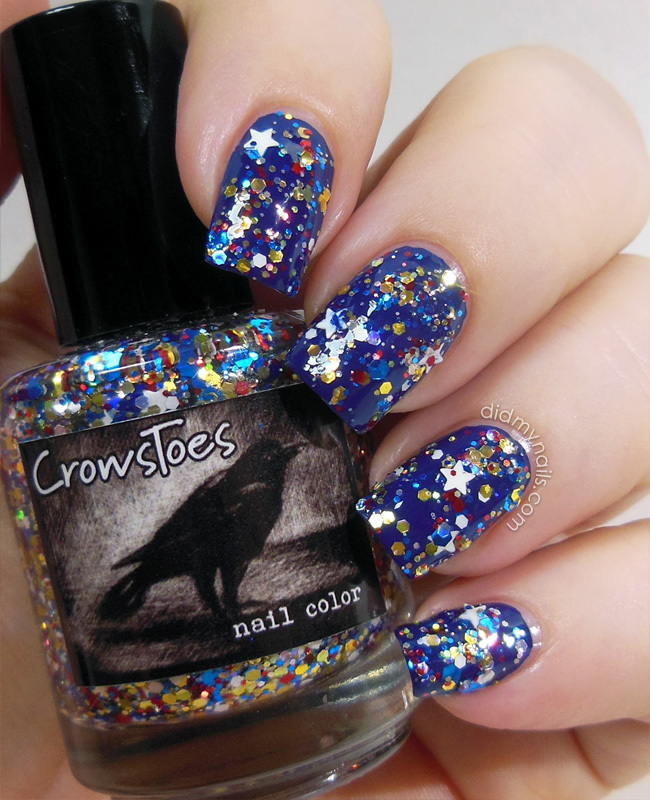 For more on CrowsToes, including other retailers around the world, visit The Polished Crow. And for more on my fellow Twinsies' favourite indies, please swing by some of the blogs below! After just barely getting May's Waybacks in before the deadline, it feels downright bizarre to have this month's already queued up to go, but my friend Mabel and I had another Buffy night on Friday, which seemed like the perfect time to give last year's tweed nail art for Giles another try. 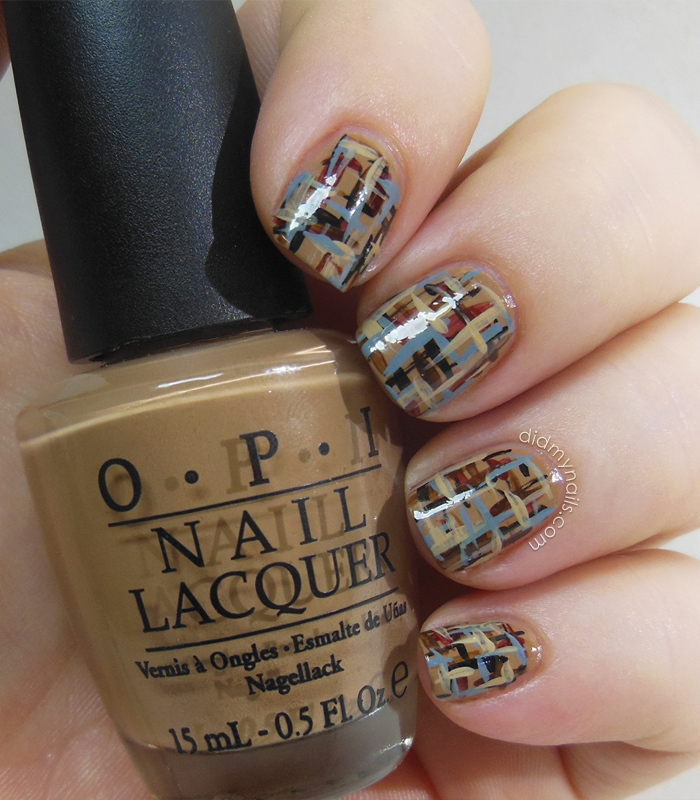 Like last time, the base for my tweed nails was OPI San Tan-tonio, and the stitch lines are acrylic paint. Unlike last year I think I did a much better job with colour choice and mixing shades and depth and size and...yeah, basically just a better job. Smaller stitches and the addition of a couple of lighter shades were probably the two little tweaks that made the biggest difference. After a quick top coating, I reallyreally wanted to go back and matte these, since they're supposed to mimic a fabric and all, but Husband voiced a strong preference for shiny. While he isn't the boss of me (that job still belongs to my Gam), it's rare enough for him to volunteer an opinion on matters of nail polish that I went ahead and let him make the call. And also because he's such a good sport about my ongoing love affair with Rupert Giles. When I first moved to Hong Kong I was pretty frustrated that the beauty supply stores carried such an unpredictable stock of nail polish by brands I'd never heard of. Since I found Cher 2, however, I've come to enjoy those trips to Bonjour, Sasa, and Colourmix to see if something in those mystery, discount bins will catch my eye. On my latest stop at Bonjour, I came across a bottle of cute-and-cheap that I couldn't wait to get home and onto my nails. I'd never heard of Castledew before, but for about $2 US, I was eager to give this Korean, indie-looking, yogurt-style polish a try. It's possible this shade is 9707, but there's so much extra print crammed onto the bottom of my bottle that I can't be totally sure. Apparently I need to hire someone younger less well-endowed in life experience to come to my flat and read labels to me because my eyeballs are lying down on the job. But anyway! At the first stroke I knew this polish would need way too many coats to reach opacity, so I layered it over a base of OPI My Boyfriend Scales Walls. Even then, it still took a good 3 1/2 coats to match the bottle's glitter density, so...not a whole lot of bang for your buck. On the other hand, it was only two bucks to begin with, and the result is still really cute. I definitely love the rainbow glitter mixture, as well as the combination of shapes and sizes. 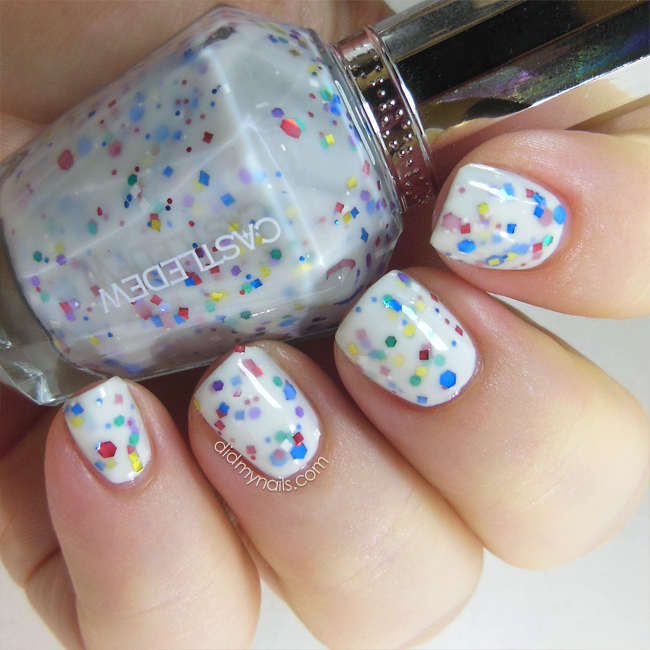 On its own, it's probably not meant to be especially dense or opaque, and as such I wouldn't recommend it as a good stand-in for indies like Pretty & Polished Jawbreaker or KBShimmer Oh, Splat!. But layered (or maybe even with some white added, which is what I'm thinking of doing), it's a soft, cheerful, nicely milky rainbow of glittery cuteness.